I moved in Woolstone near Willen Lake in 2011. One Sunday afternoon while I was going around the Lake I have discovered the Peace Pagoda. After discovering the Pagoda I got very curious and excited. As you know, Buddhism originated from India. I am from India. I am always enjoyed learning about the Buddhism and liked his teaching. I have also visited the famous Bodhi Tree, in Bodh Goya. I knew that Buddhism spread all over the world but a Pagoda and a Buddhist temple so near to my house was a big surprise for me. So I started to find out more about this Pagoda. 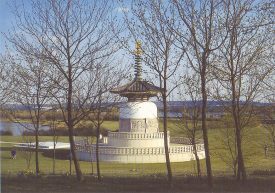 While I was doing my research I have also found out that this Peace Pagoda was inspired by one of our great Indian Leader Mahatma Gandhi. Who was a great believer in non violence movement. This Peace Pagoda was built as a symbol of Peace in Japanese cities, Hiroshima and Nagasaki. Above it 1000 cherry trees commemorate the victim of all the wars. Along side of the Pagoda is Buddhist temple, where public are always welcome. Next to the temple there is a beautiful Japanese Garden. The Monks are very pleased to welcome you to the temple and the garden. You can spend as much time as you want.